Last month, Samsung announced the Android 2.2 powered Galaxy S 4G smartphone. 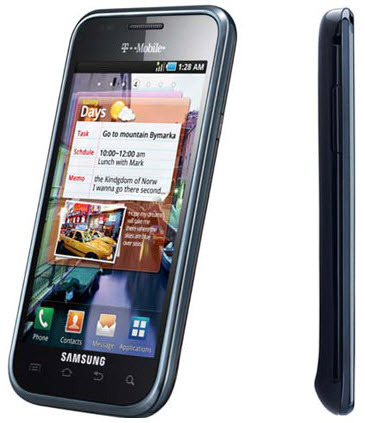 This handset is the 4G version of the Samsung’s extremely popular Galaxy S smartphone. This device will be exclusively available on the airwaves of T-Mobile in the US. The Samsung Galaxy S 4G offers enhanced mobile experiences including the mobile HD TV through T-Mobile TV, the Academy Award nominated film Inception and the T-Mobile video chat powered by Qik. It is also the T-Mobile’s first smartphone capable of delivering a peak download speed of up to 21 Mbps. Samsung Galaxy S features a 4 inch Super AMOLED touchscreen display, Android 2.2 (FroYo) operating system, 1 GHz processor, 5 megapixel camera with HD (720p) video recording, 4G Connectivity, Wi-Fi 802.11 b/g/n, DLNA, Bluetooth, A-GPS, microSD card slot, up to 32 GB expandable memory, 3.5 mm headphone jack, Android Market, Adobe Flash 10.1, FM Radio and a 1650 mAh battery. The powerful Samsung Galaxy S 4G will be available from February 23rd in the US. This handset comes with a price tag of $199.99 after a $50 mail in rebate and a two years service agreement. You can easily purchase this handset from Best Buy, Costco, RadioShack, Sam’s Club, Target Mobile locations and Walmart. According to TmoNews, select Walmart stores are already selling this handset for $148.99 with a 2 years service agreement.